Sure, you could debate legislative achievements and spheres of influence to determine who history's greatest leader was. 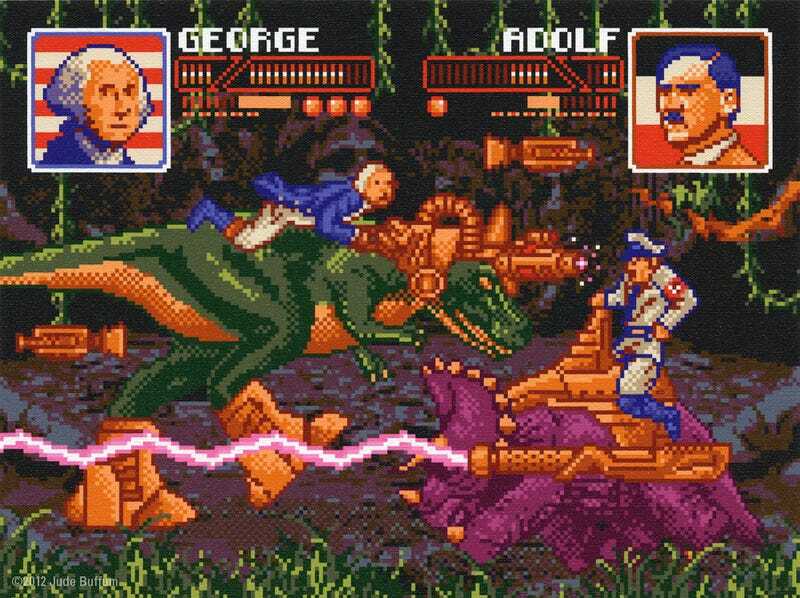 But you could also imagine an old-school video game where Teddy Roosevelt and Josef Stalin—looking a lot like Nintendo's Mario—face off riding weaponized extinct giant lizards. Artist Jude Buffum has done the latter and we are all richer for it. Buffum's work will appear alongside that of more than 40 other artists as part of "So You Created A Wormhole," a free time-travel-themed art show mounted by nerd culture collective I Am 8-Bit. The gallery show's happening to celebrate the publication of So You Created a Wormhole: The Time Traveler's Guide to Time Travel by Phil Hornshaw & Nick Hurwitch. Kotaku's scored some exclusive preview images before the show's Friday night opening in Los Angeles. Click the images to expand. Peruse the preview and you'll see clever creations where an El Camino gets the Doc Brown treatment, caveman commentary on modern life and more heads of state battle it out in the should-be-real Jurassic President video game. Attendees will also get the chance to play Capy Games' hotly-anticipated Super Time Force while it's projected onto a screen that's 25 feet tall. There's also going to be a baby stroller with the power to become unstuck in spacetime. I could use one of those. However, I live in New York and cannot leave my lovely child to attend such an awesome and free event. But some of you can. And should. Find more info on I Am 8-Bit's website.